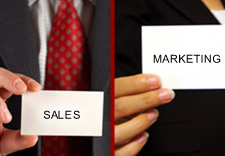 Marketing is the systematic planning, implementation and control of business activities to bring together buyers and sellers. A sale a transaction between two parties where the buyer receives goods (tangible or intangible), services and/or assets in exchange for money. 2) An agreement between a buyer and seller on the price of a security.